This wifi adapter support 2.4 GHz and 5.8 GHz. Users must simply connected to the computer USB port and driver installation. With two high gain antenna, enhance the adapter to receive the strength of the transmitted signal. Can receive and send WiFi even in long distance.The wireless transmission rate range is 1200Mbps. Added antenna to increase WiFi coverage. Adopt stable high - order intelligent chip, compatible with mainstream system. Simply update your Desktop/PC/Laptop can receive Dual Band wireless signal. Support to simulate AP working mode, with WiFi receiving/sharing function, suitable for multiple usage scenarios. Auto-detects and changes the network transmission rate. Maximum speed up to 5GHz 867Mbps or 2.4GHz 300Mbps. WiFi will greatly consume your mobile device's battery.In fact, if you often use WiFi connections on your computer, you'll notice that you need to recharge frequently.Please turn off your WiFi connection when you don't need WiFi. 【EASY TO USE】--Wifi antennas are adjustable, easy for you to find a spot with best wifi Internet connection. 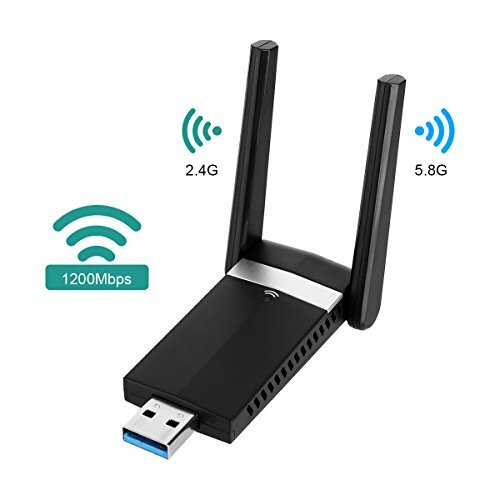 【HIGHER WIFI SPEED】--1200Mbps makes you a higher wifi speed experience.With this ultra-fast wireless adapter, you can get 866Mbps wireless speed on 5.8GHz or 2.4GHz. For movies, HD video streaming, online gaming, video chatting and so on. 【STABLE WIFI SIGNAL】--With the external antennas which are adjusted freely, enhance the adapter to receive the strength of the transmitted signal. Can receive and send WiFi even in long distance. Let you seamlessly connect with the network world anytime, anywhere. 【PACKAGE CONTENTS】--A wireless usb adapter, a CD driver and a user guide. We offer the fast response and best after-sales service for your 100% satisfaction. 【2 YEARS WORRY-FREE WARRANTY】--Our company attaches great importance to customer service. If you have any problems when using, just feel free to contact us. We will offer you our best service in 24 hours and solve the problem immediately. If you have any questions about this product by SAWAKE, contact us by completing and submitting the form below. If you are looking for a specif part number, please include it with your message.